The role of fathers often gets downplayed since they rarely seek recognition for their contributions. However, there are many reasons why your senior father deserves appreciation for the amazing things he’s done throughout your life. Since Father’s Day is right around the corner, the Harrisburg elderly care experts at Home Care Assistance have come up with some reasons why you should remind your father of his worth. In their working days, some fathers got up early and left for work long before the rest of the house woke up, while other fathers worked late into the night. Either way, your dad spent many years of his life working to ensure you had clothes, food, and shelter. While he’d never ask for repayment, it’s still a great reason to let him know his hard work was appreciated. From fixing a flickering light bulb to teaching you how to change a tire, your father is like a walking repair manual. Even better, he’s never charged for his services. He probably put tools in your hands and walked you through the steps so you would know what to do when a particular situation happened again. The next time those skills he taught you prevent a household emergency, give your father a call to say thank you. Fathers bring life into the world and then teach their kids how to truly live. As you’ve watched your father enjoy triumphs and face challenges, you’ve learned valuable lessons about how to love, let go, and celebrate life’s accomplishments. Now that your father is a senior, there are many more life lessons he still has to pass down. Ask him for advice, and he’ll be honored you value the wisdom he has to share. Your father may have always pushed you hard to help you reach your potential. However, he’s always had a soft spot for you in his heart. No matter what you have done or said over the years, your father has loved you through it all. That alone is enough of a reason to let him know you value the amazing impact he has had on your life. 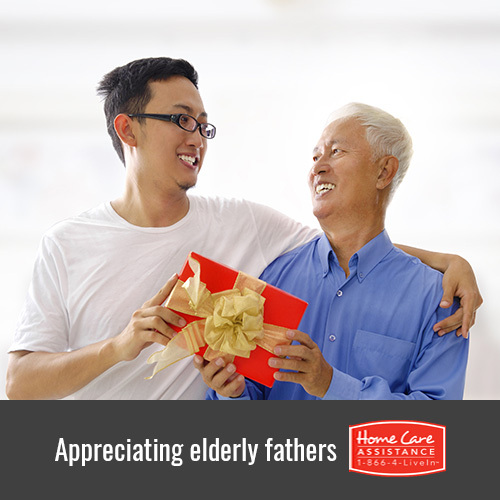 Since your father has raised you and been there for you every step of the way, show your appreciation by ensuring he maintains a high quality of life in the senior years. If your father needs some assistance around the home, the caregivers at Home Care Assistance can help. From providing transportation and social companionship to assisting with mobility and meal prep, our caregivers are available around the clock to help with a wide array of tasks. We also offer specialized Alzheimer’s, Parkinson’s, and stroke care Harrisburg seniors and their families can rely on. Call a friendly Care Manager today at (717) 540-4663 to learn more.